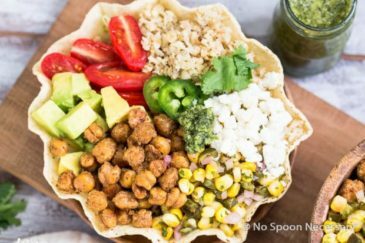 This Mexican Roasted Cauliflower & Chickpea Salad is hearty, yet healthy and jam packed with flavor. 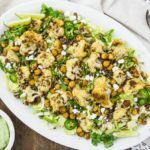 Loaded with shredded brussels sprouts, nutty quinoa, cumin kissed cauliflower, crispy chickpeas and a creamy avocado dressing, this is proof that satisfying salads do exist! Helllllo there boys and girls! 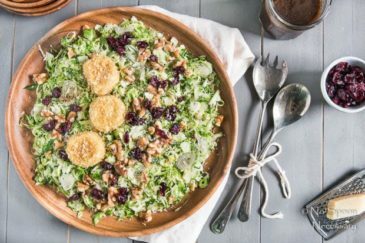 Since I totally blew your diet on Monday with ALL the sky high, streusel topped muffins, today we are going to feast on SALAD. Because while jumbo lemon muffins ARE marvelous, life is all about balance. Wait wait waaaait! 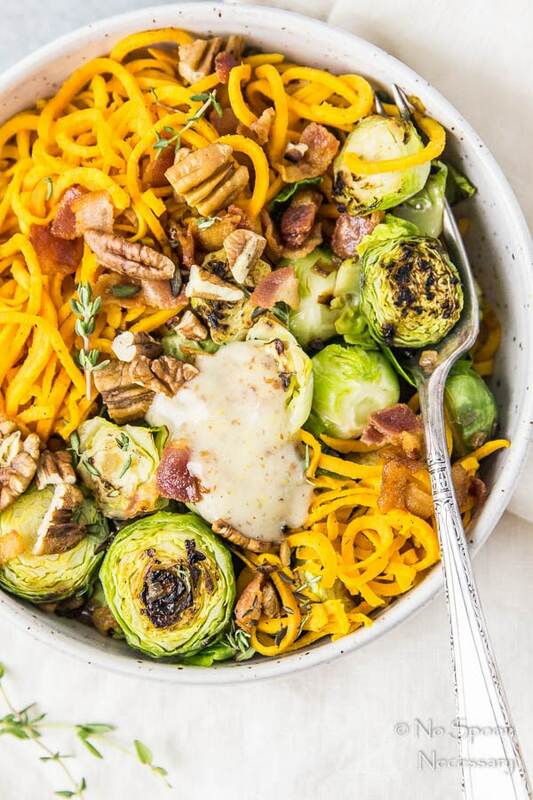 Before you give me that stinky side-eyed glare and click on the X in the upper right-hand corner of your screen, just know we aren’t eating any ‘ole snooze fest of a salad. Limp lettuce and bland, boring salads are for the birds. Today we are eating a salad LOADED with almost all of my favorite things. Minus rain drops on roses and whiskers on kittens. Obviously. I’m not sure those things would taste good in a salad. Or in anything really. I made and shot this scrumptiousness waaaaaaay back in the day. Sometime around the last week of December, if you want to get technical. I’ve TOTALLY been meaning to share it with you guys over the past couple months, but all the cozy winter eats got in the way. 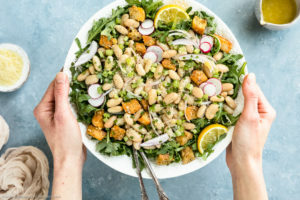 However, this salad is perfect for the first week of spring (I mean, check out ALL that GREEN!). So what matters is that I AM sharing it now. And I’m 99.99999% sure that whole ‘sharing is caring’ thing doesn’t come with time constraints or strings attached. So you and I can still be friends. Right? 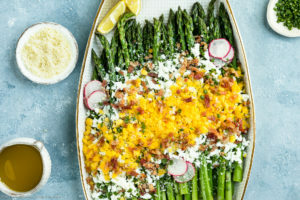 To be honest those words up there masquerading as a recipe title really don’t do this salad justice. I almost named this dish a ‘big arse super stellar salad’. However, while that title DOES have a nice ring to it, I didn’t think it was quite descriptive enough. Then, I contemplated properly naming this salad to include allllll the ingredients, but then the title was approximately 134.278 words long. And that is borderline obnoxious. Anyways, suitable recipe title dilemma aside, this salad is bomb dot com and FULLY LOADED with ALL the things delicious. 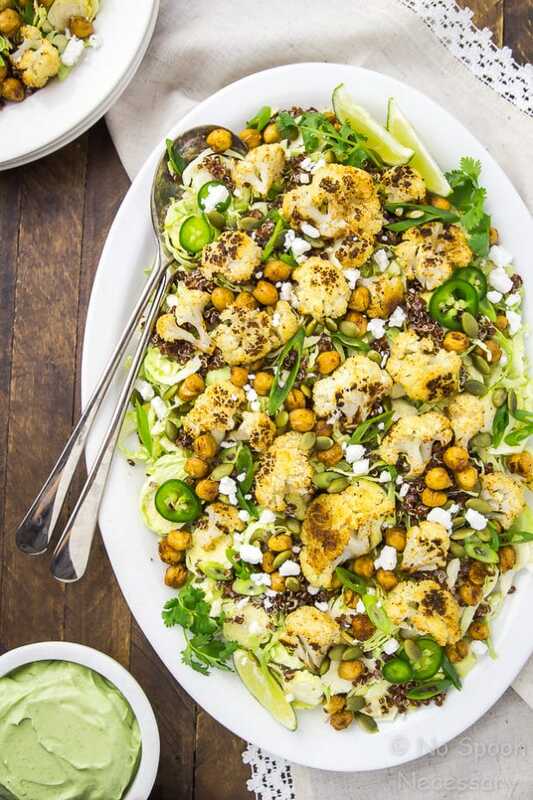 Crisp, delicate strands of shredded brussels sprouts tossed with nutty, fluffy quinoa; topped with smoky, cumin kissed and Mexican spiced roasted cauliflower and crispy chickpeas. Finished with a generous sprinkle of salty queso fresco (or feta), spicy jalapenos, fresh scallions, herbaceous cilantro and salty pumpkin seeds. 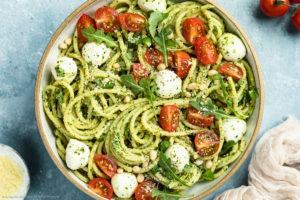 And lovingly drizzled with a rich, yet healthy, creamy-dreamy avocado Greek yogurt dressing. 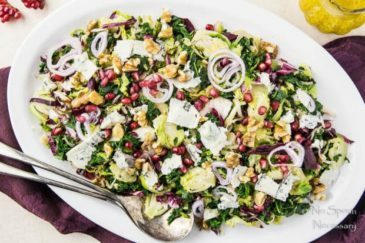 Hearty, healthy, and jam packed with flavor, this is a salad you’ll actually WANT to eat. This recipe is pretty straightforward, because SALAD, so I’m not sure it really needs a “how to make it” section. But, I’m going to humor you. Mostly because I was watching ‘Worst Cooks in America’ and it came to my attention that some people (not you of course) don’t even know how to boil water… ummm mind blowing. First you toss some cauliflower florets and chickpeas with a bit of oil and spices on two sheet pans. Transfer them to the oven and roast until everything is golden brown and delicious. 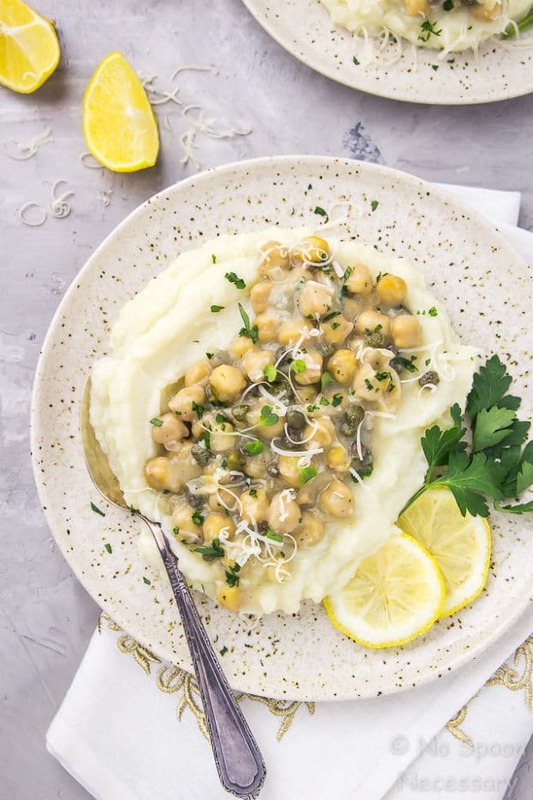 Just make sure you toss the cauliflower and chickpeas, AND rotate the pans, halfway through the cooking time to ensure everything is roasted evenly. 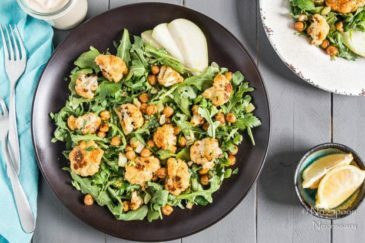 While the cauliflower florets and chickpeas are getting their roast on, whip up the dressing by combining everything EXCEPT the oil in a food processor. Process until the ingredients are creamy, and then SLOWLY stream in the oil while the machine is running. Process until silky smooth. All that’s left to do is toss some shredded brussels sprouts with a bit of cooked quinoa and top it off with the warm roasted cauliflower and chickpeas. 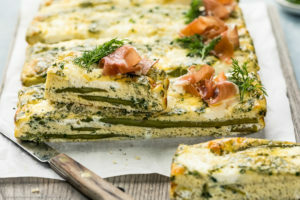 Garnish it with desired toppings, drizzle it with plenty of dressing and devour. Make sure you cook the cauliflower and chickpeas on TWO sheet pans. Overcrowding everything on one pan will cause the cauliflower and chickpeas to steam, and prevent them from getting crispy. To ensure even cooking, make sure you toss the florets and the chickpeas, AND rotate the pans (from top to bottom shelf) halfway through cooking. I used red quinoa in my salad because I like the color, but you can use white or black if you prefer. 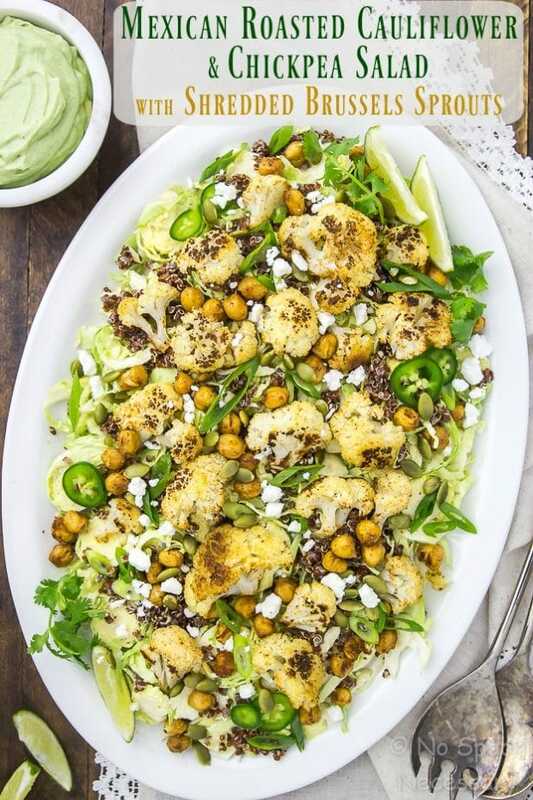 If raw shredded brussels sprouts scare you, you can add them to the sheet pans and roast them in the oven along with the cauliflower and chickpeas. I always keep a few cups of cooked quinoa in my fridge, because it is great to have on hand. However, if you are cooking quinoa just for this recipe, ½ cup UNCOOKED quinoa = 1 ½ cups COOKED quinoa. The dressing calls for Fage, which is just strained Greek Yogurt. I used non-fat Fage, but you can use low-fat or full fat, and you can use whatever brand of strained yogurt you would like. Or, you can strain the Greek yogurt yourself. To do so, simply suspend a fine wire mesh strainer over a bowl and line the strainer with cheesecloth. Dump the yogurt on top of the cheesecloth and cover with plastic wrap. Transfer the bowl to the refrigerator and allow the yogurt to strain for at least 1 hour, or up to overnight for best results. I used extra virgin olive oil in the dressing, because it gives it a richer taste, but you can substitute water if you would like. If you prefer a thinner dressing, simply stream in more oil (or water), one tablespoon at a time, until desired consistency is achieved. The dressing can be made 2 days in advance and stored, covered in the refrigerator. 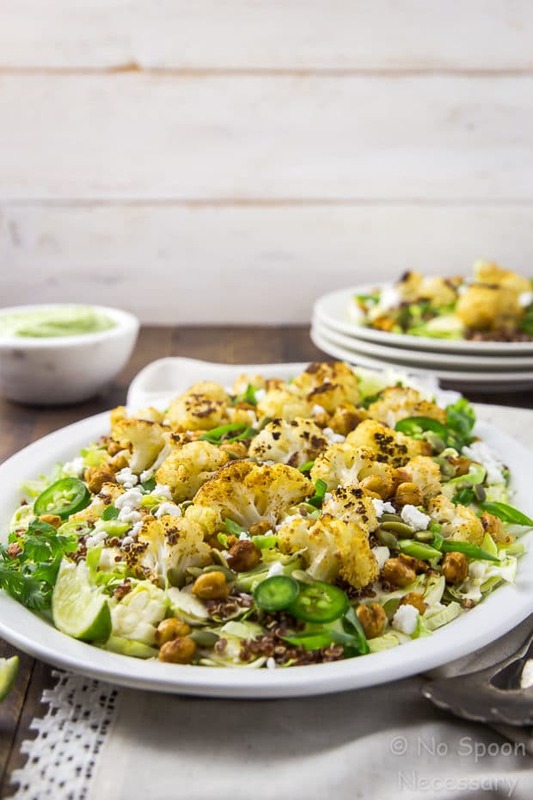 Fresh, fabulous and full of flavor, this is Mexican Roasted Cauliflower & Chickpea Salad is anything but boring. Until next week friends, cheers – to seriously satisying salads. 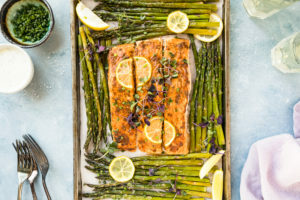 Preheat oven to 425 degrees F. Line 2 large baking sheets with aluminum foil for easy clean up. 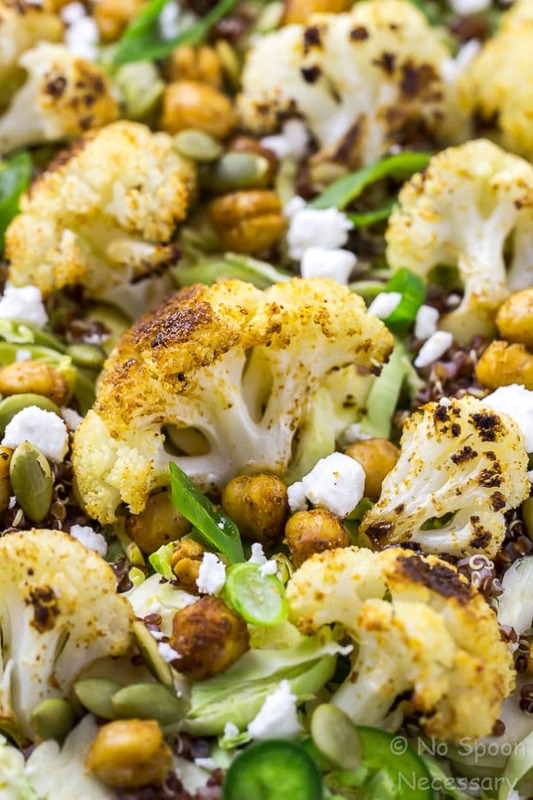 Add the cauliflower and chickpeas to the baking sheets and drizzle with 3 tablespoons of the oil. Sprinkle with cumin, chili powder, garlic powder, 1 teaspoon sea salt, and ½ teaspoon pepper. Toss to combine. Roast in the oven for 20-25 minutes or until golden brown, tossing the veggies and beans, and rotating the pans from top to bottom, halfway through. 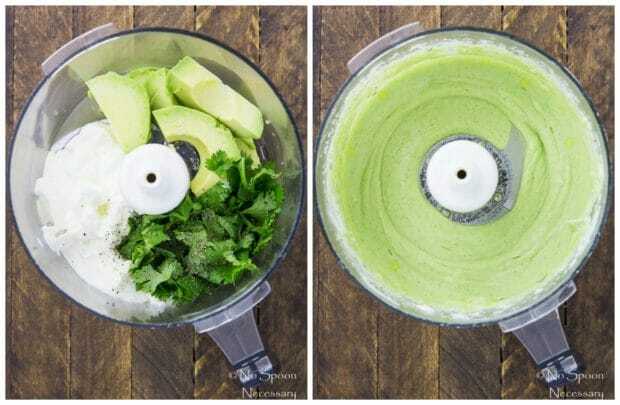 Meanwhile, make the dressing: In the bowl of a food processor add, one avocado half, yogurt, cilantro, lime juice, and a few pinches of salt and pepper. Process until creamy. With the processor running, slowly stream in 1 tablespoon of oil and process until smooth. * Taste and adjust for seasoning. Set aside until ready to use. 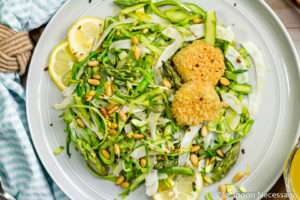 To assemble the salad: In a large bowl toss the brussels sprouts with 1 tablespoon of oil, and season generously with salt and pepper. Thinly slice the remaining half of avocado. 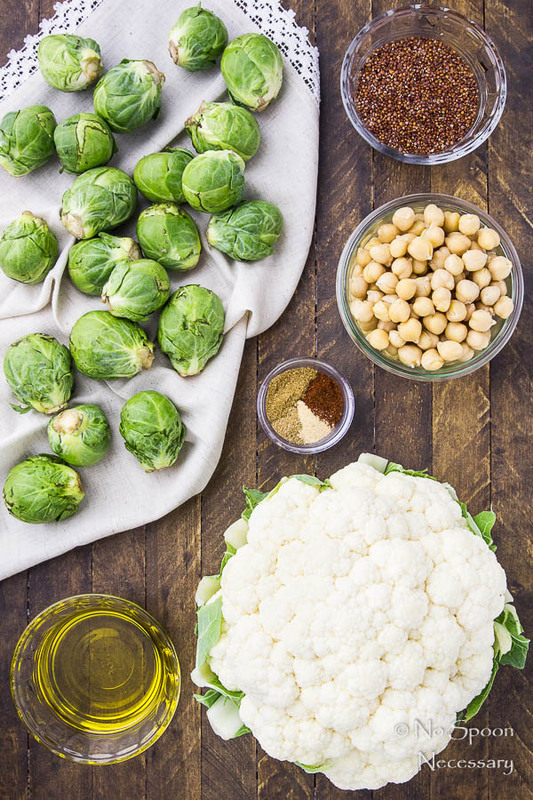 To serve: Transfer the brussels sprouts to serving plates or a platter and top with quinoa, roasted cauliflower, chickpeas, sliced avocado and garnish with desired toppings. Drizzle with the dressing and serve. Enjoy! 1. 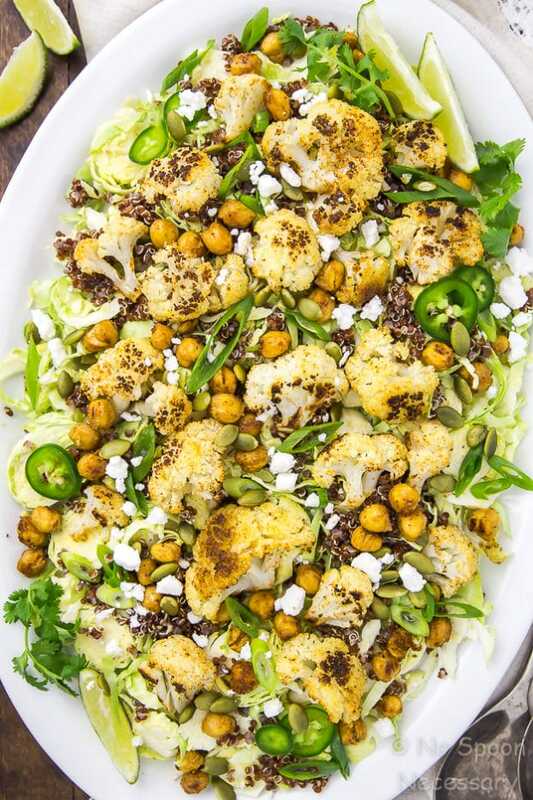 Make sure you cook the cauliflower and chickpeas on TWO sheet pans. Overcrowding everything on one pan with cause the cauliflower and chickpeas to steam, and prevent them from getting crispy. To ensure even cooking, make sure you toss the florets and the chickpeas, AND rotate the pans (from top to bottom shelf) halfway through cooking. 2. I used red quinoa in my salad because I like the color, but you can use white or black if you prefer. 3. 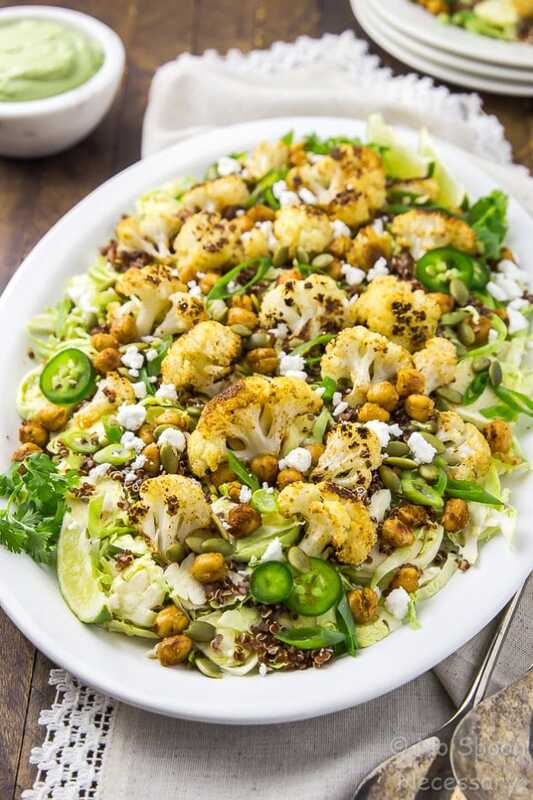 If raw shredded brussels sprouts scare you, you can add them to the sheet pans and roast them in the oven along with the cauliflower and chickpeas. 4. I always keep a few cups of cooked quinoa in my fridge, because it is great to have on hand. However, if you are cooking quinoa just for this recipe, ½ cup UNCOOKED quinoa = 1 ½ cups COOKED quinoa. 5. The dressing calls for Fage, which is just strained Greek Yogurt. I used non-fat Fage, but you can use low-fat or full fat, and you can use whatever brand of strained yogurt you would like. Or, you can strain the Greek yogurt yourself. To do so, simply suspend a fine wire mesh strainer over a bowl and line the strainer with cheesecloth. Dump the yogurt on top of the cheesecloth and cover with plastic wrap. Transfer the bowl to the refrigerator and allow the yogurt to strain for at least 1 hour, or up to overnight for best results. 6. I used extra virgin olive oil in the dressing, because it gives it a richer taste, but you can substitute water if you would like. If you prefer a thinner dressing, simply stream in more oil (or water), one tablespoon at a time, until desired consistency is achieved. 7. The dressing can be made 2 days in advance and stored, covered in the refrigerator. Nailed this! 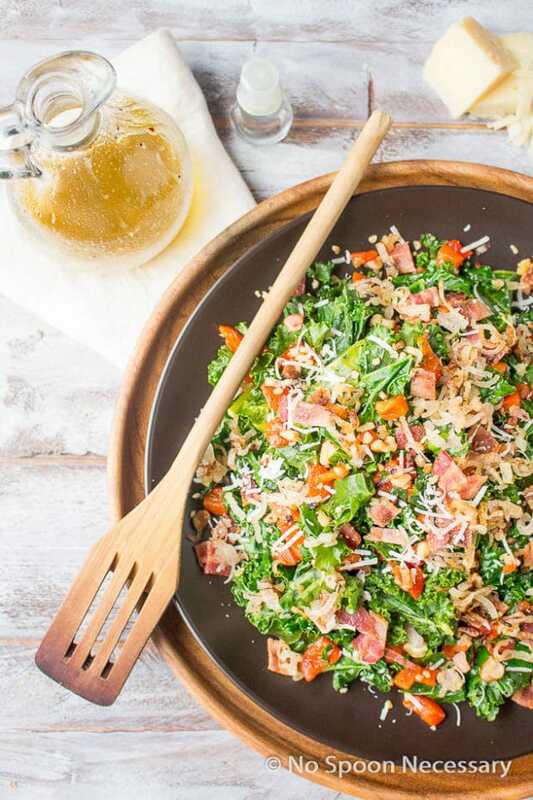 Love the combo of ingredients you chose for this gorgeous salad. That last shot with the dressing dripping onto the salad is just utter perfection. Drooling over here, and shoot, this is healthy. You are a magician too woman! 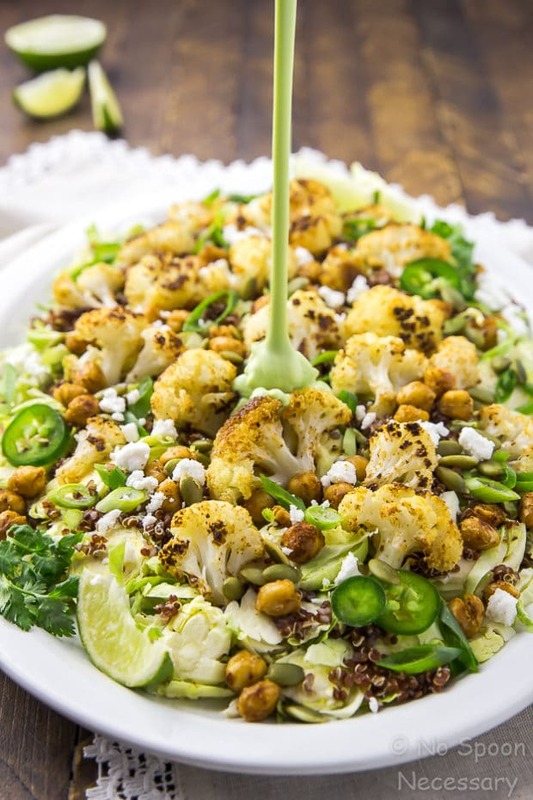 I wouldn’t have thought to add Mexican spices to cauliflower and Brussels sprouts…you really created a nice sounding salad. I love ALL the flavors blended in here. You really make salads sound amazing!